Cleaning tips and tricks that make less work for you and your family. For tough spots on clothes, use a little Simply Safe Laundry Detergent 2X directly on the spot before adding to the wash. Remember, a little goes a long way because it is concentrated. Simply Safe Laundry Detergent 2X is safe enough to use on baby and kid items (clothes, bibs, bedding, towels), and pet materials (clothes, towels, bedding), yet is affordable to use everyday. Simply Safe Laundry Detergent 2X has a low sudsing formula that can be used in BOTH traditional top load and high efficiency (HE) washing machines. Simply Safe Laundry Detergent 2X is very free-rinsing and leaves less soap residue in clothes. 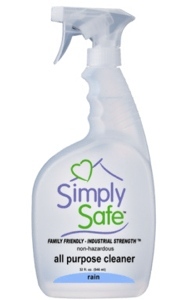 The Simply Safe Laundry Detergent 2X drain back bottle is designed for easy pouring with less mess. Once the bottle gets down to empty, here is a tip to get the last little bit of soap out of the bottle. With the bottle upright, grab the bottle handle with one hand. With the other, grab the pour spout and pull up on it (it should pop right out). The pour spout is removable. Once removed, the remaining detergent will be easy to pour out into the measuring cup. The Simply Safe Automatic Dishwasher Gel DOES NOT contain phosphates, silicates, or caustics. The hazy build up on glassware comes from the inorganic chemicals used in other dishwasher detergents, especially powders. They build up over time. Use Simply Safe Automatic Dishwashing Gel to eliminate that problem for good. 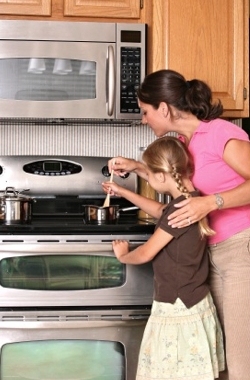 If you pre-rinse dishes before placing in the dishwasher, fill the lidded cup only. If you do not pre-rinse dishes, fill both the lidded cup AND the open cup. The gel in the open cup will spill down the inside of the door and release into the pre-wash cycle helping to insure a better wash. Under normal wash conditions, a rinse aid is not needed when using Simply Safe (because it is already built in). If you have used traditional dishwashing powders or liquids for a long time, you may need to clean your dishwasher with a Dishwasher Cleaner prior to using Simply Safe Automatic Dishwashing Gel. Dishwasher Cleaners are usually citric acid based and available at most stores. When washing delicate items like copper, aluminum, gold-trimmed or crystal, DO NOT use the Heat Boost setting or heat-related damage may result. To save energy, use only the Normal setting for washing dishes. Because it has a neutral pH, Simply Safe Floor Cleaner can be used to safely clean wood, laminate, marble, stone, tile, bamboo, concrete, composite and vinyl flooring (when diluted properly). Always mop floors with a DAMP mop and not a wet one. Wring out all excess water before mopping the floor, especially on wood, laminate or bamboo floors. Never allow water to pool on a wood, laminate or bamboo floor because water will seep in between the slats of the flooring (where there is no protective sealer coating), causing the edges to warp and curl. If diluted properly, no rinsing is required when using Simply Safe Floor Cleaner. Simply Safe Floor Cleaner is safe to use around kids and pets. Contrary to folk lore, DO NOT use vinegar to clean floors because over time, the acidity can yellow or cloud certain floor finishes. 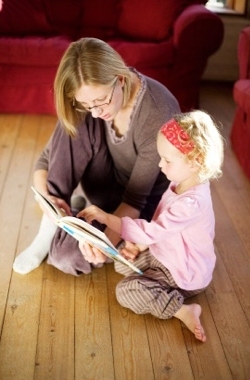 Simply Safe Carpet Stain Remover is safe to use around kids and pets. For stained areas, apply the Simply Safe Carpet Stain Remover directly to the stain, and let sit for 1-2 minutes. Scrub lightly with a towel or nylon brush, being careful not to damage to carpet fibers. Works great on pet stains, red wine, greasy soils, and many other types of stains. When Simply Safe Carpet Stain Remover is used correctly, no rinsing is normally required. Just vacuum dry carpet to restore knap. People often wonder what the best technique is to clean a spot on a carpet. The first step is to thoroughly blot the spot with an absorbent material like a paper towel to try and remove most of the excess material. The next step would be to spray the spot with the Simply Safe Carpet Stain Remover. Do not over-saturate, but spray enough to cover and wet the stain. Let sit for a few minutes, and then gently blot and/or wipe up the spot. Repeat if necessary. Once the spot is removed, allow the area to dry thoroughly. Once dry, vacuum the area to return the nap to the carpet fibers. Use Simply Safe All Purpose Cleaner to clean up those greasy areas. Great for cleaning tools and removing greasy fingerprints from cabinets and counters. Use the Simply Safe Floor Cleaner to help remove or lighten those oil stains in the concrete floor. Unlike indoor cleaning applications, it is okay to let the diluted Simply Safe Floor Cleaner soak the stained concrete garage floor for 10-15 minutes before mopping up. For best results, use a micro-fiber cloth for routine cleaning in the kitchen. It works much better than a paper towel, sponge or dishrag. For unsealed surfaces like marble, granite, concrete or other stone, it is always best to spray the cleaner onto the wiping cloth and NOT directly on the surface. This will minimize the chance for staining, but always use care when cleaning an unsealed surface. The Simply Safe Tub and Tile Cleaner is safe to use on chrome, tile, grout, marble, stone, fiberglass, and glass. Just spray and wipe as needed. When used after the last shower each day, the Simply Safe Daily Shower Cleaner can cut back on shower cleanings. It provides a detergent barrier against soap scum or water hardness build up on shower walls, fixtures, etc. The Simply Safe Toilet Bowl Cleaner is only a mild acid compared to some other brands. The best part is that there are no toxic fumes. Just squirt the product around the bowl rim, brush and let sit for a few minutes before flush rinsing. Use Simply Safe All Purpose Cleaner to clean dirty patio furniture. Safe to use on coated wicker, cedar, vinyl, plastic, cast iron and aluminum. If using on an unsealed or unpainted surface, always spray the Simply Safe All Purpose Cleaner into the towel or rag and then wipe. Do not spray directly onto the surface and always try an inconspicuous area first. The Simply Safe All Purpose Cleaner works great on cleaning greasy grills. Just spray and wipe (on cool surfaces only!). Use the Simply Safe Floor Cleaner to safely clean stone, concrete and brick patios. The neutral pH of Simply Safe cleaners will not alter the surrounding soil pH or adversely affect grass, flowers or plantings. Clean window screens using the Simply Safe All Purpose Cleaner. Just remove the screen, spray on cleaner, let sit for a couple of minutes, and rinse off. If screens are really dirty, a bit of scrubbing may be necessary.